Feb 21st 2015 UPDATE: This blog entry got about a thousand hits in the first day, including hundreds from Australia. The nurses of Nepal are very interested in keeping open the possibility of going abroad for further study, or for work, and also to be able to send remittance home while seeing the world. In Australia, it seems the government is dragging on licensure of Nepali nurses, due to inadequate documents. NOT the nurse’s documents – but the ones from T.U. Institute of Health Professions. In the coming days I will blog again about what to do – but for now, please share this widely and become informed on the issues. Here is the beginning of a book review of my novel of Nepal. द साक्रामेन्ट अफ गोड्डेस्,,अथवा नेपाली मा भन्नु पर्दा देबी को प्रसाद,,एउटा यस्तो नोवेल जसमा माया,जिबन्,त्याग्,आत्मियता जस्ता आध्यात्मिक कुरहरु को मिठो बयान गरिएको छ, यसका लेखक जो निम्जुरा एउटा अमेरिकि नागरिक र पेसामा उनि नेपाल र अमेरिका दुबैमा राजइस्टर्ड नर्स हुन्,,बिगत ७ बर्ष देखी उनि नेपालमा स्वास्थ्य को क्षेत्रमा उल्लेख्हनिय काम गर्दै आइरहेका छन्,.यो किताब उन्कै मिहिनेत को फल हो,,यसमा नेपालमा दस बर्स सम्म चलेको जनयुद्द को बेलाको.. एउट…ा अमेरिकन सर्जन र नेपाल को बेनी भन्ने ठाउँमा बस्ने साधाराण नेपाली केटी बिचको प्रेम सम्ब्न्ध को बारेमा बयान गरिएको छ,,,,,, एउटा यस्तो पबित्र प्रेम सम्ब्न्ध To continue reading the review, click here. You can buy this book at Vajra Books on Jyatha in Thamel, or at Tibet Books on Tri Devi Marg. Here is breaking news about Nepali nurses going to Australia and seeking to work as a nurse there. Since February 2014, the rules of Australia have changed and there is now more scrutiny of educational transcript than there formerly was. Several nurses I know have told me that their BN degree is being questioned and this has caused delay in accepting them for licensure in Australia. The individual nurse’s transcript is not the issue. The overall curriculum is the issue. I did some research and here is what I was told. 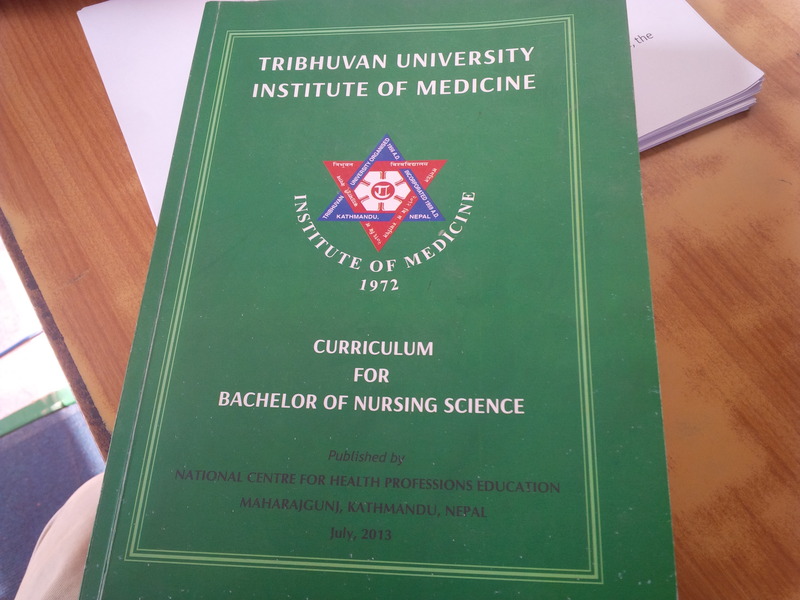 The curriculum for BN degree by TU IOM is described in a detailed book, the one with the green cover, published in 2013. Every BN program that gives a TU degree, is required to use this curriculum, and IOM takes care to achieve consistency among all the programs it oversees. 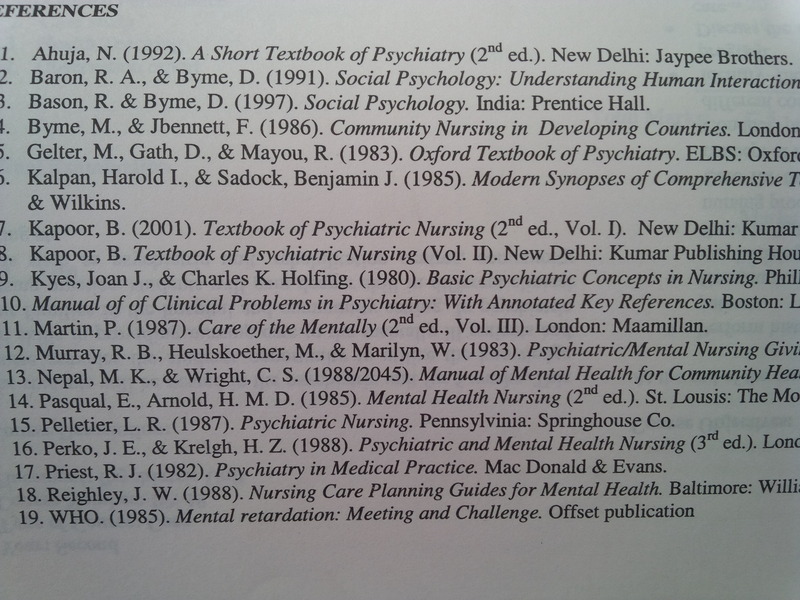 The problem is, at each section, there is a list of books used by the nursing programs in support of the curriculum. Here is a photo of such a list at end-of-chapter. Can you see the problem here? We are in 2015, and some of the references used are from 1991, which was 24 years ago. The oldest is 1983, thirtytwo years ago. If it’s true, the textbook is older than the student in most cases! The authorities in Australia say that “a nurse who studies from such old books is not up-to-date enough to be a nurse in Australia.” They won’t grant permission to work as a nurse! Now, I checked with a librarian friend, who told me that in the library where they work, the editions of the textbooks in use, are newer than the ones listed in the TU IOM curriculum book from 2013, and the actual problem is not so severe. BUT – the nurses who are now in Australia are still having the problem. This issue has been reported to TU, I am told, but I don’t know what the response is, or what the solution would be. Can we agree that something needs to be done for the future? In Nepal, every one emphasizes the need for a certificate, and no matter what the topic is, it needs to be legitimate, signed by the appropriate authorities, and with a seal or stamp. TU IOM is normally the guardian of such qualifications, but here we have a problem. If this book is not accurate, then every certificate from it, such as a BN degree, can be questioned as to legitimacy. If the authorities in Australia want to question the curriculum, they can also question every single school of nursing to see if they actually own the books listed in the curriculum, and ask for the proof that the school has them in the library, and what edition they are. Also, if Australia is doing this for the nursing curriculum, it is just a matter of time before they start looking at the MBBS curriculum, and the MBBS library and textbooks. We all need to know whether the nursing or medical education will be up to a standard acceptable abroad. This affects everybody. What if Australia looked on the actual shelves of every nursing school and medical school library? Would they find the books on the list from the approved curriculum? They might ask each individual school for some kind of documentation. Finally, I don’t blame TU IOM. In the newspapers we all read about the government approving new nursing schools and new medical schools without giving IOM adequate resources. They do it despite objections from IOM. Each new school needs a library and current books. IOM needs to have a system to make sure the books in the curriculum are the ones the students are using. We should not have new schools until the ones we have are given adequate books! get a copy of the green curriculum book, and take it to your school library. Go through and see which ones your library has and what it needs. Make sure your school has the books they are supposed to have, and they are up to date books. And If I am wrong? That is always my first question to myself……I will be the first to admit, I don’t have all the information! If there is somebody who knows more about this than me, please write and I will update with corrections when I get them. If you have an idea as to advice for the nurses who now are having the problem, send that here as well. Please share this with everyone. It may be that we need to apply political pressure to make the solution come faster than it would otherwise. We all have a stake in doing the best we can! This entry was posted in medical volunteer in Nepal and tagged Australia nursing license, Australia PR for Nepali, Australia visa for Nepali nurse, CGFNS, international nurse migration, NCLEX in Nepal, Nepal Nursing Council, Nepali nurse for further study, Nepali nurse going to Australia. Bookmark the permalink. “Thank you Joe for your recent post regarding the nursing registration in Australia for Nepalese nurses. I have been in Australia for nearly 2 and half years now. I did my 2 yrs course and had recently applied for nursing registration. My other uni friends had applied about a year ago. And they havent got their registration yet. New rules have been updated from Feb 2014, making it even harder for the registration process. They are asking for lots for documents and it is really frustrating to wait for the licensure. When it was their chance to accept us as a student, they were happy with our curriculum and they accepted in Masters degree. But now when its their time to give us registration then they are hesitating which is so annoying. If our curriculum wasn’t up to their standard then why did they accept us as a student in the first place…thats a big question. And if our curriculum wasn’t up to their standard then how come that we student are able to complete our degree. Me myself as got so many distinctions in my subjects. So how can they say that we are not eligible. Its such a rubbish. “I am aware of the fact that our uni in Nepal might not all have up to date books. But that doesn’t mean that we are any less qualified than they are. I have known some of the Nepalese nurses doing Bachelor here and I personally think we are better than them in many ways..esp practical skills which is more imp in real world. They usually have assignments focused mainly on ethics and documentations. But we Nepalese nurses are more trained to deal with real life world than just practicing on the dommy in labs. “So I personally want to thank you for raising this awareness. I too don’t want other innocent people to apply Aus in a hope to get registration..
“Everytime we call the nursing board then they always say that they are still processing our application..
“And we have no idea what to do..
“So it is very good that you opened the lid of the issues that we all were wondering. “I hope that your this recent post will help people to think twice before they apply Australia. “Thank you and have a nice day. Cheers!! “I am not sure about PCL nurses. As far as I think it will affect everyone…as everyone has to go through same registration process. But it might not be true. But for B.Sc nurses, it is 100 percent sure. We all nurses who have already applied a long time ago are just hoping that it doesn’t apply to us. But we are not sure. what was the date? was it before the new rules? I hope that what ou are describing is typical, but – I don’t know…..
Want to get Australia PR.